This November we were swamped. 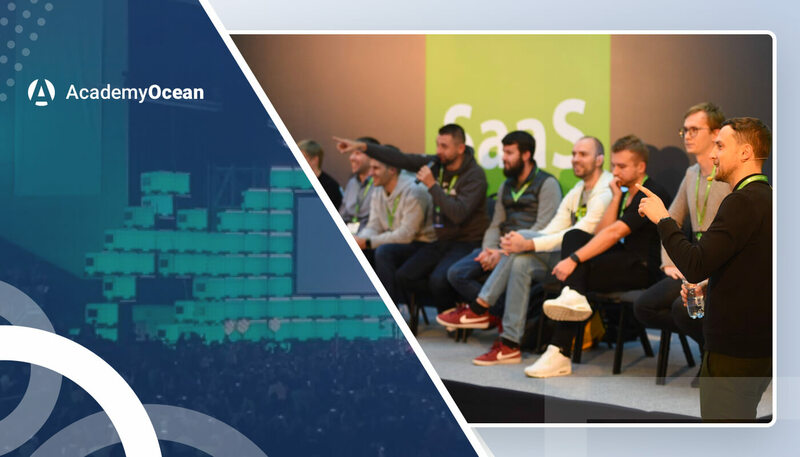 Besides working on new features for AcademyOcean, we managed to attend two conferences: Web Summit 2018 in Lisbon and SaaS Nation`03 in Kiev. We want to share our experience and thoughts on how tech conferences can help SaaS companies grow their business. A conference is an excellent opportunity to meet like-minded people, to see how others are doing their business, and also to learn from the community. Of course, speakers who are invited to these events also bring a ton of valuable information. Web Summit, being the largest tech conference in Europe, hosted so many speakers, it was impossible to listen to every speech. But even if you did not catch all of them, you could easily find people to discuss precisely what you are interested in. It’s an excellent opportunity to gain exposure for your product or company, even for your personal brand if you are focusing on that. Web Summit is indeed for everyone, even for the traditional brick-and-mortar businesses. At SaaS Nation, however, the crowd was smaller and from a more specific industry — SaaS companies — hence the conference name. This gave everyone the advantage of being closer to the speakers and other attendees. Some people attend conferences solely to connect with a specific person or company. At large events like Web Summit, this is almost impossible unless you have a scheduled meeting with the person you want to talk to. Smaller and more specialized conferences like SaaS Nation are ideal for such type of networking. As for our team, we went all out and tried to connect with as many people and companies we could during our time at Web Summit. We were sending follow-up emails for a couple of weeks after we got home. We are yet to see the final results of our Web Summit trip, but we feel it was super beneficial for us as a SaaS startup. After Lisbon and it’s 70,000 Web Summit attendees, SaaS Nation felt cozy and more relaxed. But it was far from boring. On the contrary, we had detailed conversations with SaaS founders and even had the time to show our product in action to a lot of people. We also got to listen to the invited speakers, take notes and even ask questions. If you need a video review from your clients in different cities or countries, you do not have to hire a professional video production team. A lot more effective approach is to use local video bloggers. They are usually more than capable of filming a video review, and this costs a lot less. Plus, you earn some loyalty points with the blogger. Find tech writers on UpWork . If you need to write a tech article, it is better to search UpWork for a developer who knows the topic well and pay him to write it. It will be faster and cheaper than hiring a journalist and teaching him all the nuances of that topic. Link building tip: review young companies. Write reviews about new developing products so that they publish them on their website with a link to you. New startups spend a lot of effort to promote themselves, and this can also lead their visitors to your website. Create a local rating in your niche. Do some research, create a local online rating in your niche, and try your best to be at the top. Then pitch this rating to your local media. The catch is that there are little to none local SaaS ratings out there. Journalists and bloggers from your area might be very interested in such content. As a result: you get exposure, they get good content. Overall, Web Summit and SaaS Nation, despite being quite different events in scale and content, were both super useful to us. That’s why we made a list of top SaaS conferences for 2019 we find interesting as a SaaS company. We still need to decide which ones we want to attend. Meanwhile, you can have a look at our list yourself, maybe you'll find something interesting. We hope to see you at one of these conferences in 2019!